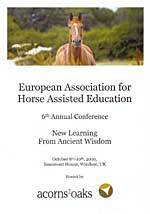 EAHAE International Association for Horse Assisted Education - 2009 Annual Conference Registration Form. 2010's conference theme was “New Learning from Ancient Wisdom”. For many hundreds of years man and horse have worked together. In recent times many more horse people have come to realise that horses are not just our working partners and pets but also great teachers. We are learning that horses can teach us about many highly valued core skills that can get lost in today’s hectic lifestyle. Engaging With Spirit -Creating a Culture of Intentional and Positive Change. 19:00 - 20:30 Showing of "Path of The Horse" video with discussion. Preliminary findings of the research including 88 youth, their parents and teachers on the impact of equine assisted learning. Balance - creating a balance between business, horses, personal life. Gerhard, born 1949, holds a university degree M.A. in political science and contemporary German literature. He has been working as an entrepreneur since 1983, started IT-Trainings in 1986 and founded G&K HorseDream GmbH in 1996 together with his wife Karin. They both started with horse assisted leadership seminars and team training in 1998 using Friesian horses as catalysts. Gerhard & Karin initiated the EAHAE in August 2004. Besides corporate training they provide national and international ‘train the trainer’ seminars addressing coaches and educators, who want to get into the Horse Assisted Education business, as well as HorseDream Partner License Workshops. In his presentation Gerhard outlined the journey from the beginning of HAE in Europe to the present, covering the achievements of EAHAE over the past six years. David Harris is an internationally acclaimed speaker, trainer, facilitator and coach. David is also a life learner in natural horsemanship. He lives in Windsor, England, with his wife, two children and three horses. He is passionate about people and their amazing potential. David says “We are all stars, sometimes we need to learn to shine”. He is the founder of Acorns2Oaks (A2O) together with his wife Sharon. The vision of A2O is for its clients to experience “Success on Your Terms”, what ever success is. Jackie works as consultant, coach, therapist and educator. She is the founder and CEO of Spirit of Leadership LLC. Jackie teaches at Case Western Reserve University and the Gestalt Institute. She is an Entrepreneur- in- Residence at Lake Erie College where she has founded and facilitates in the “Experiential Learning with Horses” Professional Practitioner Certificate training program. She lectures within the U.S. Turkey, Israel and Mexico. Jackie lives in Ohio with her Native American husband, herd of seven horses and a zebra, wolf/dog, dogs and cat. She has learned from her horses that “A herd is inclusive, everyone belongs, everyone is essential, everyone matters”. In this presentation we partnered with horses to explore leading with spirit with bringing our spiritual and business worlds together. Business people are finding that engaging their whole selves in work and home life–body, mind, emotion and spirit, and living their values and purpose strengthens the financial bottom line and sustains the well being of the organization. Partnering with horses and leading with spiritual presence we can transform our families, business and communities, uplift our human spirit and create positive change. Shannon Knapp is founder and president of both Horse Sense of the Carolinas, Inc., and Horse Sense Business Sense, LLC. Shannon has worked with and taught horses and people for over 25 years. After 10 years teaching in college, she left academia and began working with abused & neglected horses. 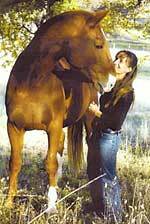 She began pairing “rescued” horses with people in 2001, and Horse Sense was formed soon after. She and her husband Richard continue to work with horses through horse rescue organizations and local humane societies and law enforcement. Shannon is certified EAGALA Advanced and is the author of the book, Horse Sense Business Sense, Volume 1, an introduction to starting and running your own Horse Therapy & Learning practice, as well as numerous other resources for Horse Therapy & Learning practices. In addition, Shannon is a Graduate Advisor for Prescott College’s Equine Assisted Learning Masters program, & offers consulting services to thosinterested in starting their own Horse Therapy & Learning business. The Shadow of a Leader: What Shadow Do You Cast? The shadow one casts as a leader/manager/horseperson has enormous impact on the kind of relationships one can experience with horses & others. This presentation will offer insight into the process of working with leaders and managers using the principles of Natural Horsemanship as a guide & metaphor for connecting and being in collaboration with others. Informed by current literature on change & motivation, we will consider (& demonstrate, if horses are available) how these concepts can be learned, practiced & internalized through mutually respectful and beneficial interaction with horses. Guideline: Lateral thinking. Planning all around. Acting directly. For 20 years now he has been the manager of Datex-Perfekt GmbH, company for professional data processing in Kueps/Bavaria, Germany. How Helmut became what he is now und what could still happen – a review forward. Eventful years: Founder and leader of an international successful pop group. Completed training as an advertising executive.Years focused on academic studies and graduated in business administration. Relevant professional experience in direct marketing. Foundation of a music publishing company. Successful years: Founding Datex-Perfekt GmbH, and employing about 350 people by now. Board member of the local marketing club. Member of economic committees, associations and professional organisations. Co-operation partner and sponsor of cultural, charitable and educational organisations. Co-initiator of an alliance plenum for families. Owner of a mobility and internet platform. Speaker for current topics. ‘2030 – How we will live in the future!’ Helmut interprets the 10 most important future trends according to Horst W. Opaschowski (scientific director of the BAT trust for future issues in Hamburg). ‘2010 –‘ Path to new learning methods’ Due to keeping present research results in perspective, important approaches for a reasonable further development of novel teaching and educational methods, also at EAHAE, have surfaced. An emerging lack of labours in Europe will accelerate the findings of alternating training methods – not only for higher executives. Jill Carey is Chief Executive Officer of Festina Lente in Bray, Co. Wicklow, Ireland, an organisation dedicated to the personal growth and development of people through and with horses. Jill has spent her career in developing services and programmes aimed at achieving quality of life enhancing outcomes. Over the past 8 years, Jill has been working with the staff and horses at Festina Lente in developing a wide range of programmes for people wishing to engage with horses in areas such as equestrian vocational training, equine assisted learning, therapeutic riding and individualized learning programmes involving equines. Jill is currently completing her doctoral theses which is researching the impact of equine assisted learning on the psychosocial well being of youth experiencing educational disadvantage. Festina Lente has been involved with two previous research projects exploring the benefits of equine assisted learning and is currently involved with four additional research projects related to the benefits of horses to humans. Jeremy is passionate about coaching. He works with senior leaders in a number of FTSE 100 multinationals and brings a raw enthusiasm, flexibility and breadth of knowledge about human development to his coaching. He is very skilled at dealing with sensitive and challenging situations and his personable approach enables him to build rapport easily ensuring that his clients feel at ease with him. Jeremy’s early career was in Finance. He holds a degree in Economics and Politics from Bristol University and a Post Graduate qualification in Corporate Finance from the London Business School. His experience as a city trader, in derivatives, and his work in corporate financing, mergers and acquisitions give him a real depth of understanding of the commercial challenges, particularly in a downturn. He is also passionate about sport. During his MBA at Henley Management College in 1999 he studied the application of sports coaching to business. He has been a coach to the Great Britain rowing squad since 1994. As a trained Master Practitioner in NLP he has a deep understanding of language structures and the impact of communication on performance. He has been working with Alan Watkins and Cardiac Coherence since 2004 and has helped numerous executives improve their performance using a truly integrated approach to coaching. Eula Rohan is an internationally recognised Horse Assisted Educator who is bringing a fresh approach to personal development working horses. With over 15 years of experience working with horses Eula has coached and trained internationally in England, Europe, America as well as Australia. She has 9 years experience in personal development work and life transformational courses. Current focus is on creating more access to horse assisted training programs within her two target markets. Generating visibility in the Australian Corporate Learning & Development Training Market whilst, continuing to increase her knowledge base in this field. A Balanced View – Eula shared insights about how she has gone about starting up this horse assisted coaching business in Australia. Within 7 months of completing my Train the Trainer in Germany I was successful in hosting 1 pilot program and 2 professional trainings. She also talked about creating a balance between business, horses, personal life. Gabor graduated as a psychologist in 2000. Since then he has been teaching at several Universities (ELTE, DE, SOTE) and working as a counselor, coach and trainer. He qualified as a licensed trail guide in 2004, and as an international equine assisted leadership trainer and licensed partner of HorseDream in 2008 – completing and enriching his psychotherapeutic methodology toolbox (autogenic training, psychodrama, hypnosis, equine assisted psychotherapy, action learning). Since it was founded in 2006, he have been the managing director of EQ-Skill company. His specific fields of interest are self-reflection based leadership development, life coaching and tailor-made crisis management adjusted to the personality. Integrating for him is a methodological issue: how is it possible to combine seemingly different methods and paradigms into one method that guarantees real, powerful and long lasting learning and changes. Working with horses became an integral part of this method in the past 6 years both in skill development and coaching. Riding and dealing with horses could be considered as an ASC (Altered State of Consciousness), which could set Equine Mediated Learning into quite a new perspective. It basically means, that Horse Assisted Education as a method is even more powerful than we have thought, because the trainer/coach has the opportunity to use (quasi-hypnotic) suggestive communication and it lets the participant to “work” in deeper and more primeval layers than his/her cognitive, rational mind. Using the tools of suggestive communication is only a technique – but understanding the background of ASC occurring in equine assisted learning situations could lead to a more sensitive (and thus more effective) way of handling individual and group dynamics and also helps to deepen the client’s learning. An empirical study first time introduced to international public at EAHAE 2010 Congress shows that horse riding leads to ASC and the so called Archaic Involvement (the relational dimension of ASC) is even deeper in this situation than in classical hypnosis by the SHSS (Stanford Hypnotic Scale). Our paper also pans out about the principles of learning and communicating in ASCs and the advantages of using positive suggestions to handle (and not only trust) the process. After spending over 20 years as part of the traditional horse world, Stormy started looking for different ways of understanding horses. Her search led her around the world as she studied and interviewed people who each held a piece of this larger vision. The Path of the Horse DVD documents this search. This provocative film has shaken up the horse world, sparking discussions, asking the viewers to take an honest look at current practices within the equine industry and to decide for him or herself what the next step is. Stormy'y current projects include exploring the human-animal connection with her horses Patrick, Sundance, and Sofi, and writing articles as well as a full-length book investigating this topic. Sormy will be filming on this trip for her next video release. Julia is passionate about helping both business and individuals facilitate change so that they can connect to their full success. After nearly twenty years working in the corporate sector for companies like Anderson and Deloitte, Julia took the plunge and decided to pursue her real passion of working with horses. Over the last five years she has been on a journey of self discovery that has taken her across the world and seen her trained and coached by a number of natural "horseman" and personal development coaches. Her new career in Equine Assisted Learning proves to be an ideal way to combine her passion with her decades of corporate experience and it was on this journey that she stumbled across the work of Carolyn Resnick. Resonating with a number of things that Caroly said about how her relationship with horses had evolved Julia was subsequently fortunate to secure an aprenticeship with her. Sarah is Head of Organisational Development for Aurora Fashions a global multi branded women's fashion retailer. Working mainly in fashion retailing with a short spell in entertainment retailing with Learning and Development and HR. Her passion has always been people development and over the years she has led many operational and project focused Learning and Development and HR teams driving both culture and individual development within the brands and businesses she has supported. Her team's work has been recognized twice with National Training Awards, she is the first multi sited fashion retailer to achieve this accolade.